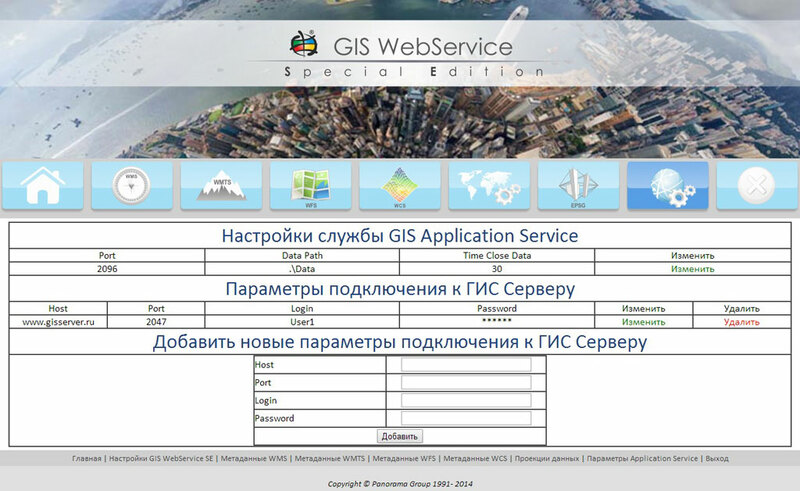 GIS WebService SpecialEdition (SE) - web-service for the publication of spatial data by protocols: OGC WMS, OGC WMTS, OGC WFS, OGC WFS - T, OGC WCS on Linux and Windows platforms under control of web-server Apache, IIS, ngnix and others. The structure of web-service includes a set of PHP-scripts and a service the GIS Application Service, which carries out the requests for processing and publication of data. ngnix 1.5.7 or higher (the fault-tolerant server for resources with high traffic). other versions of Linux with kernel version 2.6.30 or higher. 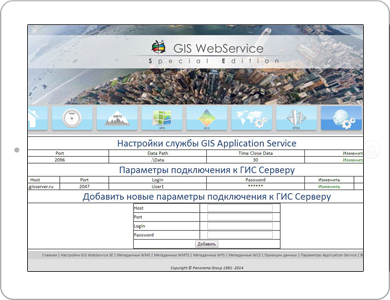 GIS WebService SE operates in the presence of service the GIS Application Service. The structure of the GisWebServiceSE program includes the module of remote administration of configuration files. 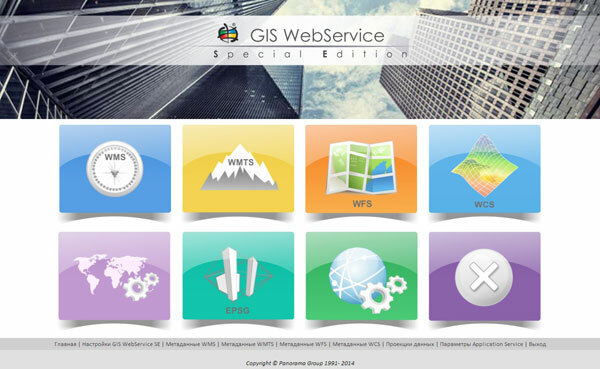 GIS WebService SE PARB.00160-01 has a client-server architecture. The application works under control of web server in the PHP interpreter environment. The client part is implemented as a php scripts, the server part in the form of service the GIS Application Service. Communication is carried out by means of TCP/IP protocol. The client part of the service consists of several modules: the module of processing and interpretation of HTTP requests (service.php), the module of customizing the parameters of service's work (admin.php). 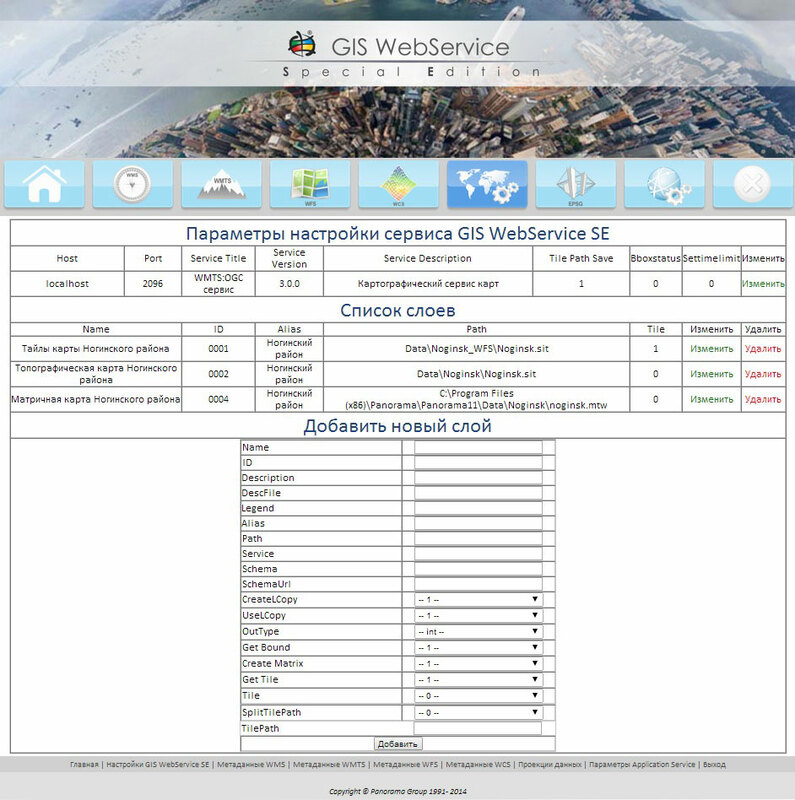 Data from the application, for example GIS WebServer SE ПАРБ.00165-01, are transferred to the web server which is responsible for handling the request. Under control of PHP interpreter the request is analyzed and is parsed by the service (corresponding events are generated). By means of sockets under protocol TCP/IP the request is transferred to the service of GIS Application Service which carries out the request. 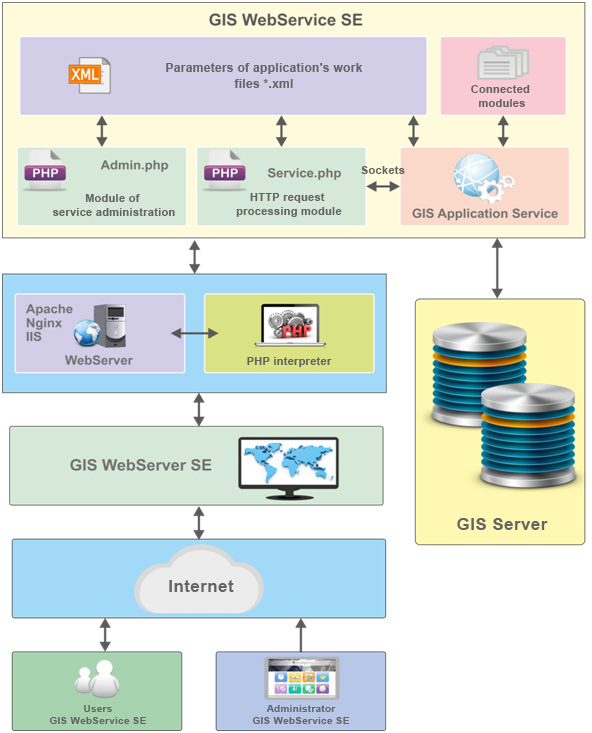 Service of GIS Application Service consists of the kernel and connected modules in the form of dynamic libraries. 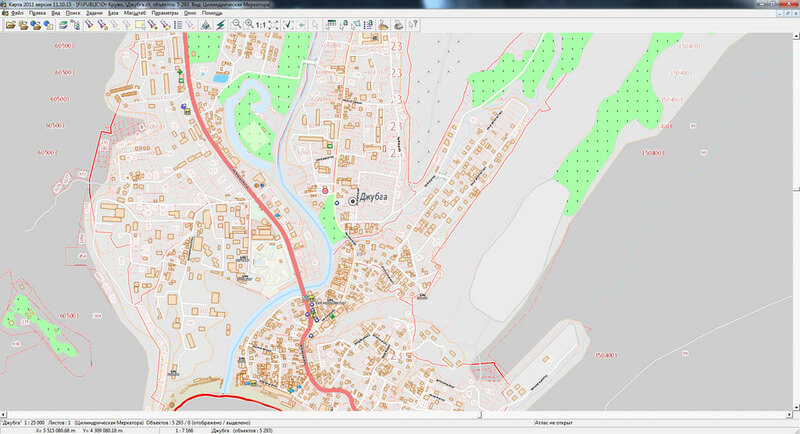 The service carries out opening of the data from virtual folders or from the GIS Server PARB.00049-01 and passes the request to the appropriate dynamic library. Functions of the interface, displaying and formation of tiles use the dynamic libraries (so or dll) and databases for codes EPSG (European Petroleum Survey Group). 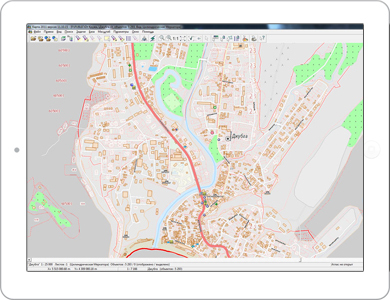 GIS WebService (GIS WebService SE) is intended for providing in network TCP\IP of the spatial information in the form of a graphic image, descriptions of conditions of obtaining the geodata and the description of characteristics of the server on granting this data, metadata, spatial information about map objects in the form of a set of the attributive, descriptive and vector information. Service allows to carry out operations of transaction for creation of new objects, an updating or deleting the existing objects in service's data sets, to give spatial data in GML format. Service is intended for providing coverages in TCP\IP network in the form of spatial information about the terrain in the format convenient for analysis, modelling and construction of three-dimensional models of data, the describing the conditions of obtaining the geodata and the describing the characteristics of the server on providing this data. 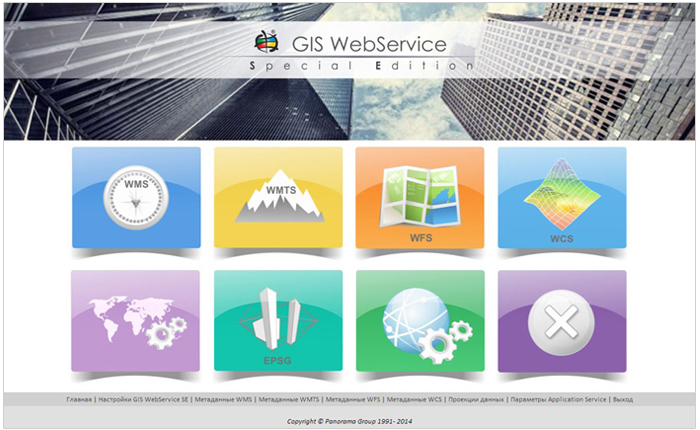 Service is developed in accordance with the specification OGC (Open GIS Consortium) for service the Web Map Service (WMS OGC) - OGC 03-109r1 version 1.3.0, with the specification OGC for service the Web Map Tile Service (OGC WMTS) - OGC 07-057r7 version 1.0.0, service OGC 09-025r1 and ISO/DIS 19142 OpenGIS Web Feature Service 2.0 Interface Standard (OGC WFS and OGC WFS-T), Web Coverage Service (WCS OGC) - OGC 09-110r4 version 2.0.1. 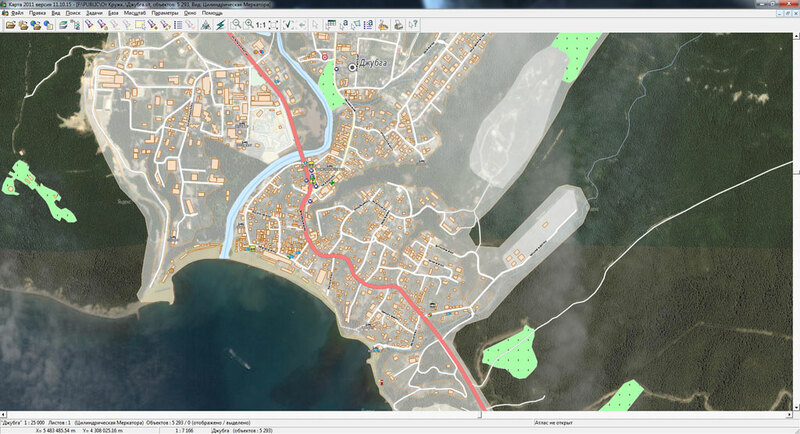 The using the standards of OGC WMS, OGC WMTS, OGC WFS, OGC WFS-T, OGC WCS provides uniform access for search, exchange and provision of geospatial data in the form of a graphic image, tiles, spatial information and creates possibilities for interaction of GIS-applications and web services. 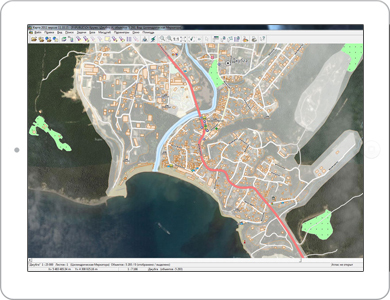 Creation of tile maps can be performed by the program of forming a map in a raster kind for Web-applications ImageryCreator or by means of service the ImageryService. 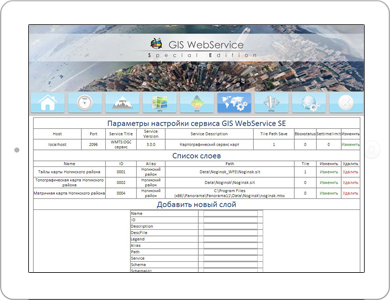 As clients of web-service the GIS WebService SE it can be the various GISs supporting OGC protocol and the users of program the GIS WebServer SE. Composition of the GisWebServiceSE program includes the module of remote administration of settings files. Administration can is carried out in the protected mode, under control of the report https. Determining coordinates of a point by a point, direction angle and distance (GETPOINTSIRECT). Search for objects by all semantics (FINDOBJECTS). Obtaining metadata and semantics of the object at a point (DESCRIBEFEATURETYPE). Obtaining information about the state of the process of constructing overlay operations between objects (GETMATHCONTROLOBJECTSDATA). Search of a minimum path by several points (CREATETSPGRAPH). Request of the scheme (DESCRIBEFEATURETYPE). Creating a copy of an existing layer (COPYMAP). Request of geo-coverage metadata (DESCRIBECOVERAGE). Request of transaction log (VIEWTRANSACTIONLOG). Request of a configuration file for third-party geoportals (GETWMSLIST). Updating the schemes of coverage in the Data Bank (DSCALLUPSCHEME). For obtaining data the GIS WebService SE supports base service operations of standards OGC WMS, OGC WMTS, OGC WFS, OGC WFS-T.
For standard OGC WMS there are supported: GetCapabilities operation, GetMap operation, GetFeatureInfo operation. For standard OGC WMTS there are supported: GetCapabilities operation, GetTile operation, GetFeatureInfo operation. For standard OGC WFS the operations are supported: GetCapabilities, GetFeature, DescribeFeatureType, ListStoredQueries, DescribeStoredQueries. For standard OGC WFS the operations are supported: GetCapabilities, GetFeature, DescribeFeatureType, ListStoredQueries, DescribeStoredQueries, Transaction. For standard OGC WСS the operations are supported: GetCapabilities, DescribeCoverage, GetCoverage. Operations are carried out by input of HTTP-requests to the maps server in the standard web browser. name=value& - set of request parameters in the form of pairs name = value. The list of possible parameters is defined for each operation of service. and other types of matrixes.